In-Studio Training is now a new feature for all our studio membership programs. Get professional assistance with every aspect of your musical career. Some thought and highlights from the 2019 NAMM convention in Anaheim, CA. Get some insight on how the pros prepare for a mixing session. Tracking drums is an art form that takes time to develop. Choosing the right preamp to pair with your studio setup is never an easy task. There are so many options out there and it can seem a bit overwhelming. This article dives deeper into some of the options available and I give you some personal advice on the preamps that I like to use for drum recordings. Two options that could make a big difference in your workflow and your wallet. Let’s look at some of the main similarities and differences between the two platforms. I’ve added a new flagship interface to the studio to add more clarity and depth to our production. I met Frank Oglethorpe at an event in San Francisco and got to hear the Atlas & Titan in action. The audio detail was giving me chills and put me in a space where the music was visual. The Titan was in a small studio room that had treatment on the walls. It was an ideal situation to test out the ability of the DA and hear some recent mixes I’d just finished vs. mixes at the hosting studio. There was a difference in the low end where the frequencies had more depth without the mud. I immediately knew I had to demo a unit at my studio to hear if the mixes benefited from the converters in the Titan. Engineer David Hughes at Shine On Studio. I connected with Jeff Briss from Cutting Edge Audio and got the approval from Frank to demo a Titan. When it arrived, I wasted no time connecting it to the HDX system. The first mix I played came to life and filled the room with rich detail and precision clarity. My eyes got large and my ears were saturated with excitement. This was such an amazing experience that I knew a Titan was the missing piece for the studio. I’ve had the Titan now for a few months and the response is exactly what I want to hear from my clients. Everyone loves the full sound and clarity that the audio has on every system they playback their music. This was a serious investment and it has already paid dividends that make it worth every penny. I highly recommend Prism Sound and their audio interfaces. Send me a message and I’ll hook you up with info on how you can connect with the right people to demo a unit for yourself. Mixing with Headphones - Which Ones to Use? Mixing with headphones can be productive if you follow a few helpful steps along the way. Let's discuss the advantages and disadvantages of mixing with headphones. Producing is the construction of music. You have to make choices about the project as a whole and this will include things like EQ, panning, compression, lengths of the delay, when to delay, when to chop up the vocals, when to add guitar solos, how the song begins and ends, and everything else that happens in between. This is not an easy task, but it does have huge rewards that are long-lasting if you do it right. There are way too many plugins out there and you may feel confused on which ones to buy and incorporate into your workflow. Here is an open discussion for you to ask questions and get insight for all those plugins. I'll regularly post any new releases or deals that I come across for those plugins that you should consider adding to your system. The dream has been achieved! I am living the life I've always wanted and it feels great to work in my own studio everyday. The rewards are tremendous and there is nothing I'd rather be doing with my time. Being so immersed in my work on a constant basis has given me the knowledge and experience that is required to work at a professional level in this industry. I know many of you are looking to attain the same goal, so let me share just a fraction of my awareness with you. First, running your own business, regardless of what you do, is no easy task. There are quite a few things you need to consider before diving into starting up a recording studio. Consider this, you'll need to cover your overhead and start up costs before you see a dime of profit. The initial investment is what overwhelms most entrepreneurs and that is just the tip of the iceberg. You're going to need a computer that is powerful enough to handle the processing, a DAW software program, an interface, lots of cables, mics, mic stands, headphones, headphone mixers, racks for gear or road cases, power conditioners, external hard drives, and potentially a studio space. This is just the foundation, there are plenty of other bells and whistles that you'll need to pull off a professional studio. Now that that idea is rattling around in your head, tackle this notion, you will need to budget for electricity, water and sewage, garbage service, insurance, a security system, and rent. So your budget on a monthly basis is around $2,000 just to keep the doors open. That's the cheap end of the spectrum, which will probably not be adequate enough to compete in the market. Now if you've invested a large chunk of change into an education in audio production, owning your own studio is the ultimate goal. These startup and recurring monthly costs are just scratching the surface of what you need to consider for operating a steady and reliable studio business. I just wanted to get your mind in motion for all that needs to be considered. Check back in soon as my next few posts will dive deeper into the elbow grease that is needed to keep a studio running smoothly and having the stamina to build a solid reputation to keep the machine well oiled. Thinking about getting a microphone to start or build on your home recording studio? Here are 10 mics you should consider. Ranging from Dynamic to USB mics that are great for singing or podcasting. Starting a home studio can be confusing at times. There's so much information on the web that you don't know where to start. Here are a few helpful tips on how to get your studio going. Start with a budget. Stick to the budget. You're not going to build a world-class studio overnight. It takes time to develop a feel for how a studio operates. Buy affordable gear at first to determine if you have the talent and stamina to run a studio. Running a studio is a full-time job and will consume all of your free time. So it's best not to invest all your money into the studio up front. Get a decent interface. One that has a few mic preamps and some routing options. As you grow, you can upgrade your interface. There are so many options, but you can find used Digidesign 192 HD interfaces on eBay for about $500. Start with one of these if you can afford the system setup. If you're on a tighter budget, I recommend an interface that has been modified by Black Lion Audio. They offer superior A/D conversion and at a price that won't break the bank. This will be the core of your studio, so spend a little bit of time researching what will work best for you. A good computer is also vital and there are many PC & Mac options. We'll get into that tomorrow. I respond to internship requests on a daily basis. Many of the requests are one-sided and offer no benefit to the studio. Here's the deal, an internship is beneficial to both the studio and the intern. If you want to intern at a studio, you have to possess some sort of value to the progress of the studio. The studio is going to give you experience and education so you can be a competent member of the industry. If you have nothing to give back, you'll never get an internship. Before you go and start pestering studios, you need to do a little prep work. Start with reading a few books on Pro Tools and recording principles. You can read books on many different topics and learn quite a bit about the industry at your own pace. Educating yourself adds so much worth to your assistance in the studio. Once you know the difference between XLR & AES cables, you will move quickly through patching and studio setup. Buy some gear and do some home recordings. Get a little bit of experience with using a DAW and play around with the settings. If you want to learn Pro Tools, go to www.avid.com and sign up to receive Pro Tools First. It's a free version of Pro Tools that will get you started. Most professional studios use Pro Tools HD, so there will be a slight learning curve, but getting familiar with the fundamentals is important. Watch a few videos on YouTube and ask some questions in forums. Do not show up to the studio with a bunch of questions. When you're in the studio, just observe! You're there to learn and the engineer is there to work. If clients are on the studio, keep your yapper shut. If someone asks you a question, answer them, but that should be the only time you speak. If you do have questions during a session, write them down and save them for after the client's session. It all boils down to manners and common courtesy. You need experience and that is what you should absorb. Being in the room while a session is happening is chalk full of experience. Pay attention to how the engineer conducts the session. Keep track of how many takes are recorded and how they're recorded. When the session is over, start to help with the break down. Ask the musicians if they want help loading their gear. Be helpful and it will be rewarded. How many of your mixes have plugins strewn across each and every channel? I'm going to guess almost all of them or at least a good portion of them. Are you relying on the plugins to make your recordings sound better? Have you ever tried to mix with just panning and volume adjustments? Today's modern engineer has become too dependent on digital enhancements of recordings. Things like proper mic placement and quality mic preamps have been replaced with software that constantly needs to be upgraded. Thus, music is loosing the ambiance and mood of the performance that was captured in the studio. Lush layering techniques are being replaced with copy & paste keyboard commands. I pose this challenge to all engineers that are mixing with a DAW; make a rough mix of your recordings with no plugins just so you can hear the naked truth about your mics, mic placement, and room reflections. Mastering what mic to use and where to place it to capture the best sound will exalt your recordings to unparalleled quality. Musicians will flock to you once you've learned how to capture the purity of sound and translate it in to timeless recordings. If you are using plugins like training wheels on a bike, it's time to grow up and learn how to balance your mixes with knowledge and experience. Recently recorded a project that had some heavy guitar riffs. The guitarist wanted to get that overdriven tone, but still retain clarity. This is always a challenge for any engineer. Mic choice and placement are crucial. Amp volume rears its ugly head in your face and can create a nightmare for you in the mix. Here's how I did it without spending a lot of time trying to get just the right take in one shot. Setup a few mics in front of the cab. I like to use a Shure SM57, Shure SM7B, Sennheiser e606, and Sennheiser 421. Put one in front of each cone slightly off-axis and pointing away from each other. Then run the guitar to a DI for tracking the clean signal and then thru to the amp head. Based on how many mics you setup + the DI, you'll have a decent amount of tracks to work with. Normally, I don't use all the tracks, plus there can be phasing issues. All I need is one good track from the take and we're golden. The first take should be at the level of overdriven tone that the guitarist prefers. 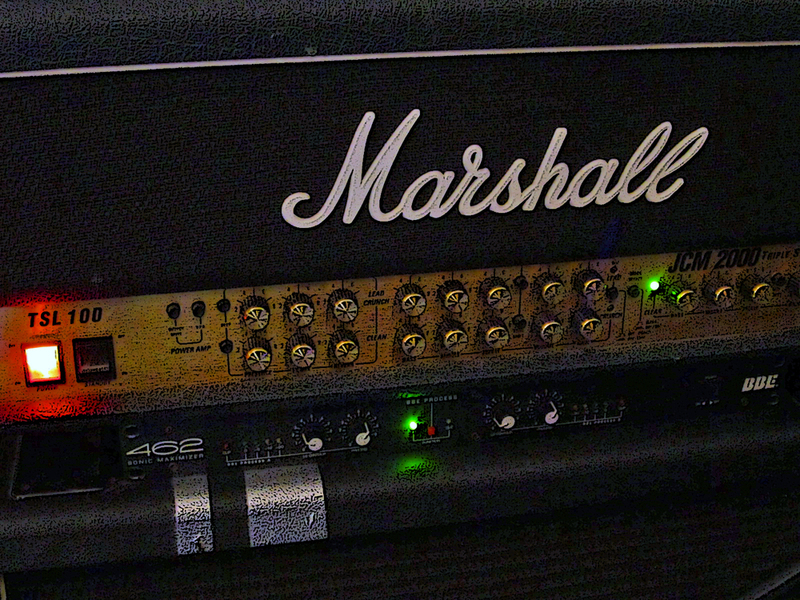 Then reamp the clean signal with the amp at a slightly lower volume. This should give you more clarity from the performance. You can keep doing this routine until you get enough layers to blend in the desired sound for the guitar tone. Pan out the different takes and adjust volume levels to widen the mix. This is just the concept. You'll need to experiment with your setup to find out what works best. Tracking drums is an art form that takes years to get right. There is a lot of trial and error, so get used to disappointment. You have to really grasp your mics, gear, and room. That said, there's one major problem with tracking drums. The drummer keeps changing. Not all drummers can be good studio drummers, so here's a few tips on making sure you get good drum tracks on your recordings. First, studio drumming is not the same as live performance drumming. When you have microphones all around your kit, it does take a little finesse to get good takes. Second, the drum setup is completely different in the studio. There needs to be separation between the high hat / cymbals and the toms. This means that the cymbals need to be raised up higher so they're not in the same plane as the drum heads. You may not agree with me, but your album will be all washed out. Third, microphone placement is crucial! This one I can't stress enough. If you have a tom, a cymbal, or whatever the hell is on your kit and you only hit it once, get it out of there. That can be overdubbed later and does not need to take up real estate that the mics need. These are just the foundation for a good drum setup in the studio. Leave comments or questions if you want to hear me rant some more. The biggest drum seems like the easiest drum to mic, but this big fella can be tricky at times. You really have to pay attention to the music. The tone of the kick drum needs to match the tone of the music. This requires selecting and placing the right mic in the right spot to capture the tone that you need. There are a few options I recommend. The Shure Beta 52 is a rock solid mic for any recording. It provides depth, punch, clarity, and snap that works well with virtually every recording. You can never go wrong when using this microphone to record your kick drum. My backup mic is the AKG D112. This egg-shaped mic is versatile for many recording applications, so it's an excellent choice for those of you on a tight budget. Besides kick drum tracks, this mic works well for recording any instrument that has a lot of low-end detail. I've used this microphone to record congas, bass guitar, trumpets, horns, and vocals. So for the $199 price tag this mic carries, it's well worth the investment. The third microphone that I recommend is a little unorthodox. The RODE NTK is a secret weapon that I like to use when I need a bit more slap in the kick drum. It's a tube-based condenser that has a magical sound when placed in just the right spot. Usually I find that spot slightly off-center in front of the drum head. The $499 price on this mic does put it in the slightly expensive category, but this mic can do it all. From vocals to acoustic guitar, this mic is excellent on almost any recording. Hope this helps you get better kick drum recordings. Happy tracking.